After spinning 12 oz. of pale yellow wool for my Bears, Beets, Battlestar Galactica scarf (which is finished! Photos coming soon! ), and another 4 oz. of a semi-solid for some secret spinning (also done! Photos coming...eventually), I was ready to spin something with some color changes. But apparently I am a tiiiiiny bit commitment-phobic when it comes to choosing roving colors, and I couldn't decide whether I wanted something pastel, or something dark, or something neutral-- so I ordered a 4.4 oz. 'Odds and Ends' bag from Into The Whirled Fiber Arts and got a bit of every possible color and fiber. I took this photo yesterday morning, but I'm actually finished with the whole 4.4 oz. now and have a beautifully full bobbin. Now I'm working on spinning up some gorgeous grey alpaca and merino blend to ply it with, because as much as I love how vibrant and saturated the Odds and Ends are, I'd like a more subtle overall effect for the shawl I'm planning on knitting with it. I hope you're enjoying this rainy Tuesday-- it's perfect weather for curling up with tea and yarn! What fun the colors are! I spun a bunch of felting odds and ends from around the house. 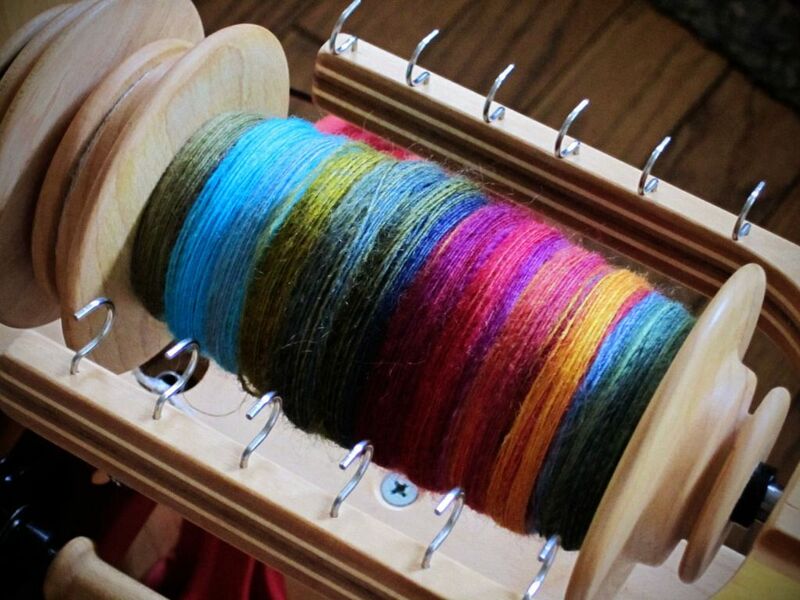 The best part is watching all the colors spin together, especially when plying! That's such a good way to use felting quantities of roving! And I totally agree with you, watching the colors come together during the plying is so much fun-- even just plying the colorful singles with the grey, it was so neat to see how each one combined with it.